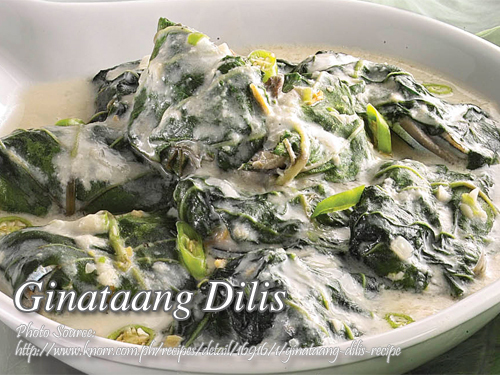 This ginataang dilis recipe is made by wrapping the fresh anchovies in taro root leaves (gabi leaves) then simmered in a mixture of coconut milk, spices and seasonings. This dish is great as viand accompanied with steamed rice or served with other dishes like grilled meat, fish or seafoods. To cook ginataang dilis; Cut off dilis head. Wash and drain. Combine dilis, grated young coconut, onion, garlic, ginger and green pepper (mince or slice pepper if you want it a hot and spicy dish). Season with salt and MSG. Wrap 2-3 tablespoons mixture in gabi leaves. Form into squares or rectangles. Tie with a string. Arrange wrapped mixture in a pan, pour in thin coconut milk. Cover and let boil for a while then lower heat and simmer until cream is reduced into half. Add the thick coconut milk. Simmer again until thickens and oil comes out. Cut off dilis head. Wash and drain. Combine dilis, grated young coconut, onion, garlic, ginger and green pepper (mince or slice pepper if you want it a hot and spicy dish). Season with salt and MSG. Wrap 2-3 tablespoons mixture in gabi leaves. Form into squares or rectangles. Tie with a string. Arrange wrapped mixture in a pan, pour in thin coconut milk. Cover and let boil for a while then lower heat and simmer until cream is reduced into half. Add the thick coconut milk. Simmer again until thickens and oil comes out. Then, it is ready to serve.